The thing about going to see a Gecko play, is you never know quite what you are going to get. Sometimes even when you've been to see it you still might not be sure what you just saw, but you're always entertained. Missing by Gecko was not my first trip with them, and trip is probably a good word to describe their style, in more ways than one. 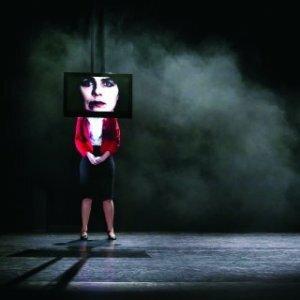 Their shows take you on an emotional journey, and quite often into the world of the bizarre and surreal. But if you've never been to one, a Gecko show is a wonderfully blended mix of dance, physical theatre, ballet, mime, puppetry and incredibly well thought out staging and lighting. One thing you can say about Gecko is they know how to make an impact, so much so in the first few beats of the show they made a fair amount of the audience jump out of their skin and shriek, but I won't say how, for those yet to see it. First impressions of the staging feature a couple of conveyor belts arranged across the stage which made for some great choreography, shapes, silhouettes and interesting movement techniques. These conveyors are used and rearranged throughout the show, in different configurations, for different purpose. All moved smoothly within the action, in fact so smoothly that at some point during the latter half of the show, one of the conveyors leaves the stage and I was that entranced I didn't see it go. The show tells the story of Lily, we see her life told from the almost present. We watch her work, play, fall in love, get married and fall out of love - because something is Missing! There are wonderfully simple and elegant sequences and tricks to show the progression of her life, just simple things like crossing of legs shows early clumsiness in a relationship, getting in synch as they get to know each other. We also see flashbacks to Lily's childhood, very cleverly delineated with back lit picture frames, very effectively conveying the past, as if looking through an old photograph album. The young Lily is portrayed by a selection of puppets, with an outstanding, if a little chilling, sequence as she walks. The full grown Lily often also superimposes herself into the past, with a very poignant moment clinging to her parent's legs as they argue. Incredible story telling, mostly without language, yes there are lines here and there, but they are not all in English, and it is amazing how it really doesn't matter. Most of the story is told by actions, be that straightforward acting or huge extravagant dance or mime. When I read the premise I did wonder whether I would be able to figure out what was missing, but I got it, and it got me. I suspect it will get you too if you go and give Gecko a try.